Walnuts:- This nut is a common ingredient of our daily life. We eat it in chocolates, cakes and cookies. It is good for the skin and body. Many branded makeup and skin care brands include walnuts in their ingredients as they are packed with essential nutrients. The English walnut tree provides clusters of small flowers called catkins. These when self or cross pollinated gives the nutritious walnut. They are the traditional food of the Mediterranean’s, South Americans and Asians. It also has a very versatile culinary use. It is most grown in the US. The consumption of the nut has increased considerably after the increased information about its health benefits became known to people. Nutritional Profile:- The nuts are rich source of energy and contain health benefiting nutrients, minerals, antioxidants and vitamins that are essential for optimum health. 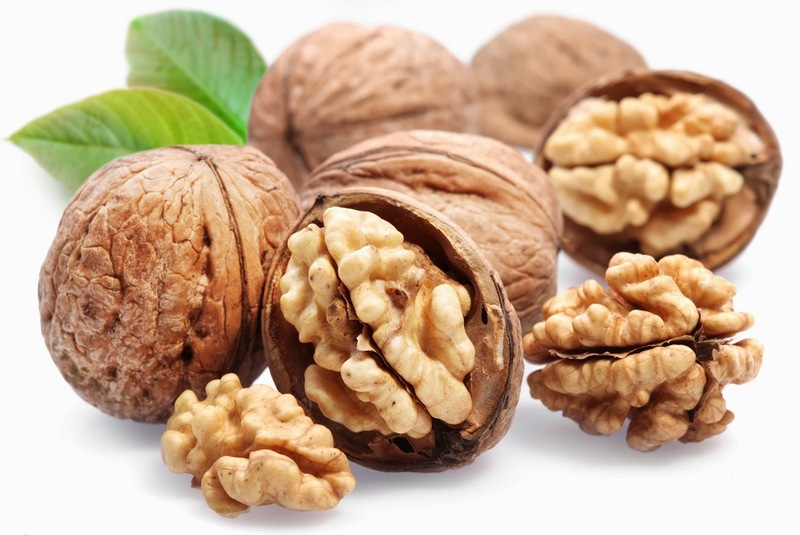 Walnuts are a good source of anti-inflammatory omega-3 essential fatty acids like - alpha-linolenic acid, oleic acid, linoleic acid, and arachidonic acids. It is rich in antioxidants, and is a good source of manganese, and copper, it also has calcium, chromium, iron, magnesium, phosphorus, potassium, selenium, vanadium and zinc. Vitamin B6 is the found in good quantities in this nut. This nut also has phytonutrients like phenolic acids, ellagitannins, tellimagrandins, flavonoids, which are anti-inflammatory compounds. It is a very good source of gamma-tocopherol form of vitamin E. They have a rich source of monounsaturated fatty acids to about 72%. Regular intake of walnuts in the diet helps to lower total as well as LDL or “bad cholesterol” and increases HDL or “good cholesterol” levels in the blood. These nuts are packed with many important B-complex groups of vitamins such as riboflavin, niacin, thiamin, pantothenic acid, vitamin B-6, and folates. How Much should we eat:- To have a healthy life the first step one must take is to eat upto 1 ounce or 14 halves of walnut every day. It has 190 calories, 2.6 gm of omega-3 fatty acids and a good concentrated source of Vitamin E and magnesium. It can be taken as an anytime snack. It can be added to salads, yogurt, breakfast cereals, or oatmeal. It can be added to fresh or dried fruits. It can also be added to white rice, quinoa and whole wheat pastas. 1. HEART: - The omega-3 fatty acids are very essential for our cardiovascular system. It reduces high blood pressure, and bad cholesterol in our body thereby encouraging the production of good cholesterol. 2. IMMUNITY: - The anti-oxidants present in the nuts helps to keep our immune system healthy and prevent the onset of diseases. 3. BRAIN: - The omega-3 fatty acids help the proper and smooth functioning of the brain and the nervous system. It helps to improve memory power. 4. BREAST CANCER:- eating a few walnuts every day helps to keep the risk of most common breast cancers away. 5. INFLAMMATORY DISEASES:- Asthma, Arthritis, Eczema kind of diseases can be prevented due to the fatty acid content of the nut. 6. BONE HEALTH:- Omega-3 fatty acids, alpha linolenic acid, and its compounds are closely associated with strong, healthy bones. 7. SLEEP AND STRESS:- the melatonin present in the nut helps us to have a better sleeping pattern. The fatty acid reduces the blood pressure which ultimately relieves us from stress. 8. PREGNANCY:- The Vitamin B complex comprising of folates, riboflavin thiamin and more are present in the nut which is necessary for pregnant women and the growing fetus. 9. CONSTIPATION AND DIGESTIVE SYSTEM: - The fiber content in the nut helps to keep our digestive system functioning properly. It helps in the proper movement of our bowels. 10 SKIN: - the Vitamin B complex and Vitamin E helps to fight free radicals which is an excellent stress and mood manager. This inversely helps us to have better skin and delays the ageing process. The walnut oil is a good moisturizer and also helps our body to grow healthier and radiant cells. 11. DARK CIRCLES:- Regular application of warm walnut oil helps to lighten the dark circles. It is a wonderful soothing agent, relaxes our eyes, and retains its glow and color. 12. HAIR:- The potassium, Omega-3, Omega 6, and Omega 9 fatty acids present in the nut strengthens the hair follicles thereby leaving our hair long, strong, healthy and glowing. It also prevents Balding. 13. ANTI-DANDRUFF AGENT:- it is a natural anti-dandruff agent because of its high moisturizing properties. 14. HEALTHY SCALP:- Its anti-fungal properties help to keep ringworm infections at bay. Regular application of the oil keeps the scalp moisturized and hydrated. 15. HAIR COLOR:- The husk of the nut has rich amount of various proteins, which helps naturally color the hair and makes it glow.